AT&T Moto X owners, here we go! 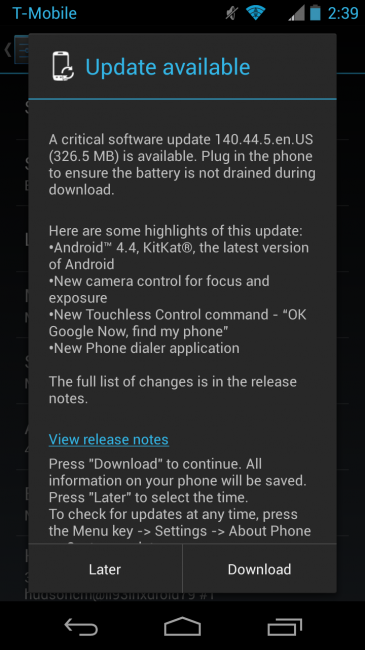 The Android 4.4 “Kit Kat” update has been approved and is now rolling out to all devices. We had initially expected a soak test to begin and marinate for a few days, but Motorola and AT&T appear to be happy with their work. Our AT&T unit is not a part of the soak and we were able to pull the update with a single check. As you can see, the update is a sizable 326.5MB, but it is indeed Kit Kat. To pull the update head into Settings>About phone>System updates. As of this update, three separate Moto X variants (Verizon, T-Mobile, and AT&T) have all been upgraded to Android 4.4 just three weeks after Google made it official. There are Nexus devices that only received the update yesterday, so consider us impressed with Motorola’s quickness. Note: Ignore the T-Mobile message in the notification bar. This is my unlocked AT&T unit with a T-Mo SIM inserted. Cheers Nick and everyone else!